Payments are safe and secure. 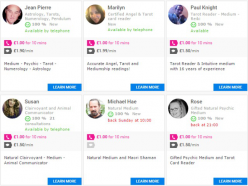 You can pay for a reading using debit/credit card including now, Paypal. Select the Pay Per Minute or Packages option, we accept all major credit and credit card including Paypal. All your online transactions are safe and secure. Paying with Paypal? It is simple. Select the amount to add to your Astrofame Wallet, it is free and you are able to top up anytime. Did not use the complete amount of you wallet? Rest assured, the remaining amount will be available for your next reading.